Here are ideas for what you can do with leftover corks - and all the pagans I know seem to get plenty of them. If you’re a wine enthusiast or just love to host a party, have you ever wondered what to do with your left over corks? Rather than throwing them away or leaving them to take up space in a drawer why not get imaginative with some cork art this Christmas. Cork Christmas Tree: If you want your friends to be rocking around your Christmas tree this year, try making one out of wine corks. The beautiful colour of the wine stained corks makes it a lovely centrepiece on the Christmas dinner table. Click here for a guide on how to make one. Cork Christmas Wreath: You’ll be the talk of Tinseltown with a festive wreath made out of natural cork on your front door. Your neighbours will be asking how to make one too. Click here for guides on how to make them. Cork Reindeer: Are you in need of inspiration for cool and different decorations for your tree? 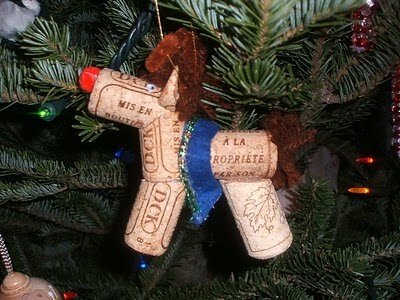 Make it personal by handcrafting your own Christmas cork reindeer! Click here for guides on how to make some. Capture Christmas: Christmas comes but once a year, but you can make the memories last beyond the new year by following the age old tradition of the silver coin. When a bottle is shared on a happy occasion, take the natural cork from the bottle, making a wish that the happiness you feel on this occasion is repeated, placing a coin in a slit in the top of the cork as you do so. Sleep with the cork under your pillow then rub the coin any day after this for good luck! Christmas Lists: Christmas is full of lists from gift ideas, menu suggestions, party invites and new year resolutions. Keep them all in one place on this handy cork inspired noticeboard. Use a wooden frame of any shape or size and simply fill with corks. Cut them into disks to display colourful patterns for your very own stylish notice board. Turn On Your Christmas Lights: Brighten up your Christmas by making your very own lampshade out of cork. Make sure you use heat resistant glue! A Christmas Tree Is Not Just For Christmas: Rather than disposing of your Christmas tree, you can replant it in the garden to re-use it next year. To help it to grow, cut up your used corks and grind it into a fine mulch to help the tree to retain water. Bring Cork To The Table: Every dinner party host knows that place settings are a great way to greet your guests at the table. You can make some personalised ones by using natural cork as the holder. Just slice through the length of the cork and insert a piece of decorative card with your guests’ names. New Year Resolutions: Everyone has good intentions to kick start the new year with a list of resolutions. To help you stick to these, why not make it fun by writing each one on a natural cork and popping them into a vase so you can keep referring to them. Don’t just throw away your natural corks this Christmas, use these top tips to create something cool and quirky or take your left over wine corks to Laithwaites Wine shops, where they will be recycled. That is so cute, Great Idea! Personally, I've got this thing in my kitchen, and I love it! Pallas Renatus - I love your kitchen ornament with old corks!